Read that headline one more time. Then look at this picture. 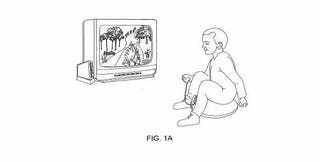 And prepare yourself for the eventuality that no, this is not a joke, meaning yes, Nintendo actually patented an inflatable horse-riding peripheral for the Wii. It's a small, inflatable cushion with a dock for the Wii Remote. So that when you rock/bounce the horse, the controller is able to register the movement. You are then supposed to hold the nunchuk as you would a horse's reins. If it were a horse. We'd imagine it could just a easily simulate the riding of a donkey, camel, llama, alpaca or Asian elephant. Or if those animals aren't your style, maybe you'd be more interested in riding some of the examples Nintendo themselves provide in the actual patent, like bulls, burros, dolphins, whales, dragons, griffons, unicorns and giant eagles.